Phoenix, Arizona – Seldom do we have the opportunity to read what nationally known Black politicians have to say about the Honorable Elijah Muhammad and his programs. 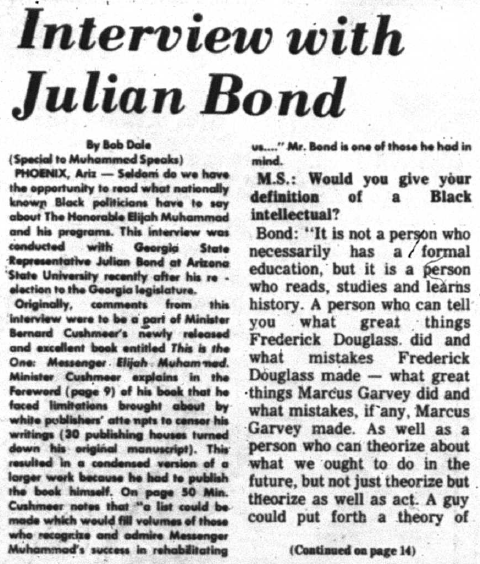 This interview was conducted with Georgia State Representative Julian Bond at Arizona State University recently after his re-election to the Georgia legislature. 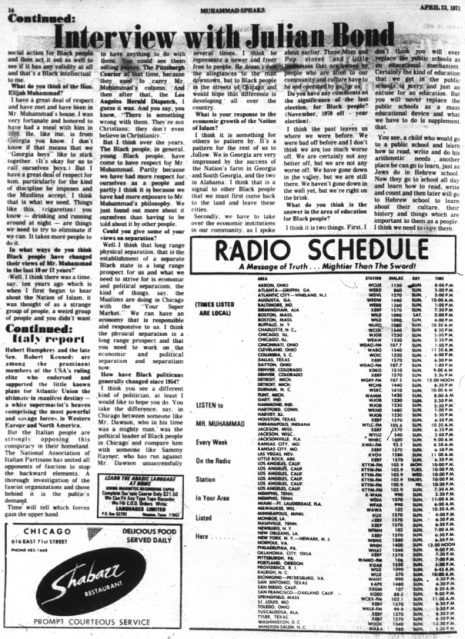 Originally, comments from this interview were to be a part of Minister Bernard Cushmeer’s newly released and excellent book entitled This Is The One: Messenger Elijah Muhammad. Minister Cushmeer explains in the Foreword (page 9) of his book that he faced limitations brought about by white publishers’ attempts to censor his writings (30 publishing houses turned down his original manuscript). This resulted in a condensed version of a larger work because he had to publish the book himself. On page 50 Min. Cushmeer notes that “a list could be made which would fill volumes of those who recognize and admire Messenger Muhammad’s success in rehabilitating us…” Mr. Bond is one of those he had in mind. M.S. : Would you give your definition of a Black intellectual? Bond: It is not a person who necessarily has a formal education, but it is a person who reads, studies and learns history. A person who can tell you what great things Frederick Douglass did and what mistakes Frederick Douglass made – what great things Marcus Garvey did and what mistakes, if any, Marcus Garvey made. As well as a person who can theorize about what we ought to do in the future, but not just theorize but theorize as well as act. A guy could put forth a theory of action for Black people and then act it out as well to see if it has any validity at all and that’s a Black intellectual to me. M.S. : What do you think of the Hon. 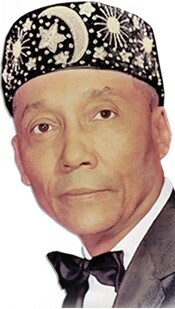 Elijah Muhammad? Bond: I have a great deal of respect and have met and have been in Mr. Muhammad’s house. 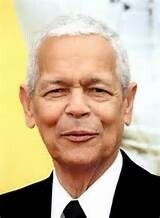 I was very fortunate and honored to have had a meal with him in 1968. He, like me, is from Georgia you know. I don’t know if that means that we “Georgia boys” like to stick together. (It’s okay for us to call ourselves boys.) But I have a great deal of respect for him particularly for the kind of discipline he imposes and the Muslims accept. I think that is what we need. Things like this (cigarettes) you know – drinking and running around at night – are things we need to try to eliminate if we can. It takes more people to do it. MS: In what ways do you think Black people have changed their views of Mr. Muhammad in the last 10 or 12 years? But I think over the years the Black people have come to have respect for Mr. Muhammad. 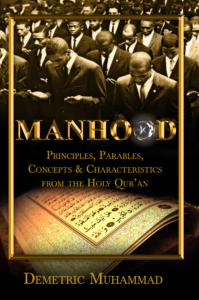 Partly because we have had more respect for ourselves as a people and partly I think it is because we have had more exposure to Mr. Muhammad’s philosophy. We just found out more about it ourselves than having to be told about it by other people. Bond: Well, I think that long range physical separation, that is the establishment of a separate Black state is a long range prospect for us and what we need to strive for is economic and political separatism, the kind of thing, say, the Muslims are doing in Chicago with the “Your Super Market.” We can have an economy that is responsible and responsive to us. I think the physical separation is a long range prospect and that you need to work on the economic and political separation and separatism now. MS: How have Black politicians generally changed since 1954? Bond: I think you see a different kind of politician at least I would like to hope you do. You take the difference, say, in Chicago between someone like Mr. Dawson, who in his time was a mighty man, was the political leader of Black people in Chicago and compare him with someone like Sammy Rayner, who has run against Mr. Dawson unsuccessfully several times. I think he represents a newer and freer free to people. He doesn’t owe the allegiances to the man downtown, but to Black people in the streets of Chicago and would hope that difference is developing all over the country. MS: What is your response to the economic growth of the Nation of Islam? Bond: I think it is something for others to pattern by. It’s a pattern for the rest of us to follow. We in Georgia are very impressed by the success of the Nation’s farm in Georgia and South Georgia, and the two in Alabama. I think that is a signal to other Black people that we must first come back to the land and leave these cities. Secondly, we have to take over the economic institutions in our community, as I spoke about earlier. These Mom and Pop stores and little businesses that are owned by people who are alien to our community and culture have to be and operated by us and for us. MS: Do you have any comments on the significance of the last election, for Black people: (November, 1970 off-year election). Bond: I think the past leaves us where we were before. We were bad off before and I don’t think we are too much worse off. We are certainly not any better off, but we are not any worse off, but we are not any worse off. We have gone down in the valley, but we are still there. We haven’t gone down in the well yet, but we’re right on the brink. MS: What do you think is the answer in the area of education for Black people? Bond: I think it is two things. First, I don’t think you will ever replace the public schools as an educational mechanism. Certainly the kind of education that we get in the public schools is sorry and just an excuse for an education. But you will never replace the public schools as a mass educational device and what we have to do is supplement that. You see, a child who would go to a public school and learn how to read, write and do his arithmetic needs another place he can go to learn, just as Jews do in Hebrew school. Now they go to school all day and learn how to read, write and count and then later will go to Hebrew school to learn about their culture, their history and things which are important to them as a people. I think we need to copy them. Next PostNext Imam Michael Saahir Wrong On Minister Farrakhan…again!